Stantler in game: 6,831 Who? Important notice! Pokemon Stantler is a fictional character of humans. 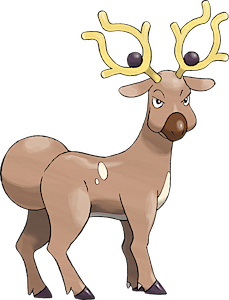 Stantler (Japanese: オドシシ Odoshishi) is a Normal-type Pokémon introduced in Generation II. Stantler is a quadruped, caribou-like Pokémon. It has a tan pelt with a cream-colored belly and a few spots on its back. Its tail is large, short, and round, and each of its legs ends in a black hoof. It has a large, brown nose and a pair of pale cream-colored antlers, each with a black orb in the center. The shape of the antlers and the black orbs causes them to resemble eyes. Stantler can distort reality and compose illusions with its antlers by subtly changing the flow of air around them. Staring into them composes an odd sensation, as if one is being sucked through them, and one may become so dizzy that it is impossible to stand. Its strange antlers are very valuable artifacts to Pokémon hunters. The species was nearly driven to extinction for its beautiful antlers. Additionally, the round balls found on the fallen antlers can be ground into a powder that aids in sleeping. Stantler lives in herds in mountainous forests. As shown in the anime, a baby Stantler that is separated from its herd and frightened will instinctively produce an illusion of a big, stampeding herd to scare away perceived threats. In The Little Big Horn, Brock helped a Stantler fawn reunite with its herd. A little while before that, Stantler composed an illusion of a stampeding herd of Stantler in self-defense, but it was later seen through by Brock. Multiple Stantler also appeared in Celebi: Voice of the Forest. In Different Strokes for Different Blokes, Ash got lost in a forest that contained many Stantler with his Turtwig. Some of the Stantler used Hypnosis on the two, giving them various hallucinations. Paul caught one of the Stantler but released it almost immediately after deciding that it wasn't worthy for his team. Santa Claus has a group of Stantler to pull his sleigh as shown in Stantler's Little Helpers, officially replacing his Ponyta. A Stantler was one of the Pokémon seen at the Pokémon Swap Meet in Tricks of the Trade. Two Stantler were seen in the wild in The Legend of Thunder!. A picture of a Stantler appeared in Hocus Pokémon. 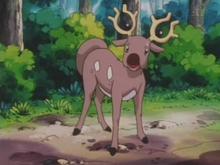 A Stantler was one of the Pokémon seen in a forest outside the Ice Path in EP250. A Stantler was one of the inhabitants of the Dragon Holy Land in Fangs for Nothin'. A Stantler appeared in Misty's flashback in Gotta Catch Ya Later!. A pod of three Stantler appeared in A Bite to Remember. A Stantler appeared in Lucario and the Mystery of Mew living in the Tree of Beginning. It was also seen as part of Lila's famous "tiger lily smile" in Battling the Generation Gap!. Many Stantler appeared in Giratina and the Sky Warrior. A few Stantler also appeared in Arceus and the Jewel of Life. A Coordinator's Stantler was used in the Battle Stage of the Daybreak Contest along with a Magcargo in Playing the Performance Encore!. A Stantler appeared in the opening scenes of Zoroark: Master of Illusions. EP125 Stantler Ash's Pokédex Stantler, the Big Horn Pokémon. The eye-like shape at the base of its horn produces a pleasant odor and has a bewildering effect on anyone who smells it. It can also compose startling realistic illusions by shaking its horns. Stantler form herds, and live in mountainous terrain. DP006 Stantler Ash's Pokédex Stantler, the Big Horn Pokémon. Its large curved horns subtly bend the air around them, which composes a mysterious warp in reality. 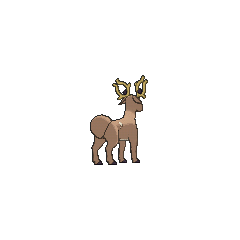 A Stantler appeared in Ecruteak City in The Reawakening. Stantler appeared in Celebi: a Timeless Encounter. Stantler first appeared in Elekid Incorporated under the ownership of Professor Oak, who used it often for transport during its appearances. 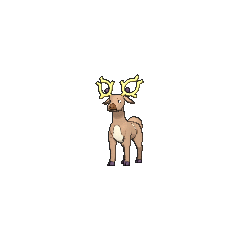 Another Stantler appeared in The Last Battle XIII as one of the Pokémon sent to help the fight in Ilex Forest. The curved antlers subtly change the flow of air to compose a strange space where reality is distorted. Those who stare at its antlers will gradually lose control of their senses and be unable to stand. The round balls found on the fallen antlers can be ground into a powder that aids in sleeping. Stantler's magnificent antlers were once traded at high prices as works of art. As a result, this Pokémon was hunted close to extinction. Staring at its antlers composes an odd sensation as if one were being drawn into their centers. Moves marked with a superscript game abbreviation can only be bred onto Stantler in that game. 51%-100% HP My antlers compose a weird space where reality is distorted! 26%-50% HP I've lost half my HP already. Level up My level went up! My weird reality field turned weirder! For other sprites and images, please see Stantler images on the Bulbagarden Archives. Stantler is found on Route 36, which leads to Violet City, the game counterpart of Nara, Japan, a city where many tame deer roam freely. It appears to be based on a sika deer or reindeer, and 鹿威し shishiodoshi or "deer scare", a Japanese device traditionally used to scare deer and birds away from gardens. Stantler may be a combination of stag or stare and antler. Odoshishi may be derived from 鹿威し shishiodoshi.